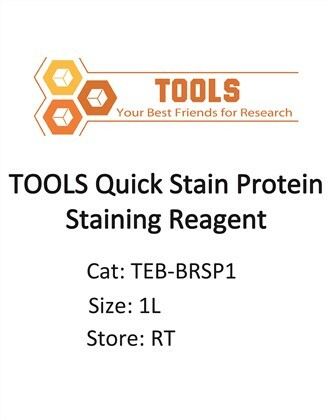 TOOLS Quick Stain Protein Staining buffer is a ready-to-use staining buffer based on Coomassie dye. It works with native-PAGE, SDS-PAGE, iso-electric focusing and 2D gels. After electrophoresis, the gel is stained, rinsed by H2O and photographed. Separate fixation or de-staining steps are not needed.